I guess you could say this is my link party but on my ELK Studio’s Facebook page! Every week people send their (WIPs) or finished projects to share on my page. We have a lot of fun seeing all the different talents of so many people. We get everything from baby items, beanie hats, blankets, scarves and jewelry. There is never a dull Monday around ELK Studio which is exactly why I created it in the first place. I wanted to spice up my Mondays, and I can say that I really get excited about what I may get to see. 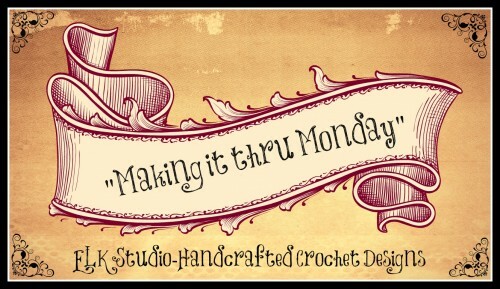 Make sure the project is crochet or knit and made by you! Submit your project via email at elkstudiocrochet@gmail.com or you can upload you picture to my Facebook page. Tell a little about the project. Provide a link to the pattern or designer if possible. Provide a link to your Facebook business page, Etsy or Ravelry shop. On my blog the following week, the top two viewed submissions will be featured, so be sure to send good information along with your picture. Each person that submits a photo will also be added to my “Making it thru Monday” Pinterest board, so join and follow along! If you are chosen, then don’t forget to grab your “I’ve Been Featured” button!